This past Friday, Congregation Beth El joined with our friends and neighbors at the NIA Masjid & Community Center for their weekly Jumu’ah prayer service. Last spring, my friend Ashraf Latif, Ameer of the NIA Masjid, spent Erev Shavuot, during our Tikkun Leil Shavuot learning session, teaching about the Qur’an. After ending his daily Ramadan fast with an iftar, he joined us so that we could compare and contrast the concepts of revelation in Jewish and Muslim scripture. Over the past few years, we have developed a friendship and a commitment to learning from each other about the other’s faith. We also have a shared commitment to standing up for the other. In the winter of 2015, when presidential candidates first mentioned the possibility of a discriminatory Muslim Ban in this country, he was the first person I reached out to – to let him know that his community is not alone and their Jewish brothers and sisters stand with them. This past Hanukkah, when the local South Orange menorah was vandalized, his call was the first I received; he and his community offered to help however possible. Weeks ago, we found each other among the hundreds who had gathered late into the night at Newark International Airport, protesting the President’s executive orders that had banned immigrants for seven Muslim-majority countries from entering the United States. At that moment we truly understood the fierce urgency of now and we reaffirmed our commitment to be there for each other. The first step was our synagogue joining the NIA Masjid & Community Center last week during their Jumu’ah prayers. Our goal was to stand in solidarity with our Muslim brothers and sisters during this time of uncertainty and fear in our country. We intended for the afternoon to be a day of standing with them, but we were blown away by how simultaneously, they stood with us. We were welcomed by their entire community. While we initially stood in the back of their prayer space, as to not disturb the ritual and intention of the service, after being publicly welcomed, so many parishioners came up to us to welcome us and thank us for being present. We were comforted by the words of Imam Daud’s weekly sermon, words that focused on standing up for justice, words that mirrored the teachings of our Torah, words that were so similar to what we often learned and taught. At that moment, I took the opportunity to not just observe or be present, but to pray as well. I whispered words of prayer privately to myself, the text and liturgy of our faith, and concluded with the hope that Oseh Shalom Bimromav, Hu Yaaseh Shalom Aleinu v’al Kol Yisrael v’al Kol Yoshvei Tevel. May the Divine One who makes peace in high places, bring about peace for us and all of the Jewish people, and all who dwell on earth. My prayers may have been in Hebrew and may have come from our liturgical afternoon Mincha service. But there was no doubt that I felt as if I was praying with all those present. My kavanah, my intention, was uplifted by being in a holy space and by being among those present. After the Jumu’ah service, we were invited to join members of the community for lunch and to get to know each other better. The community members went out of their way to make sure there was kosher food, so that we would feel comfortable eating, labeling a variety of foods as under kosher supervision and as “dairy” and “pareve”. As we took turns introducing ourselves, we came to understand and appreciate our shared beliefs, even if we practice different faiths, and our shared commitment to know the other and care for the other. Furthermore, we acknowledged the communal fear that was felt, but promised each other that we wouldn’t let that fear define us or determine our lot in life. 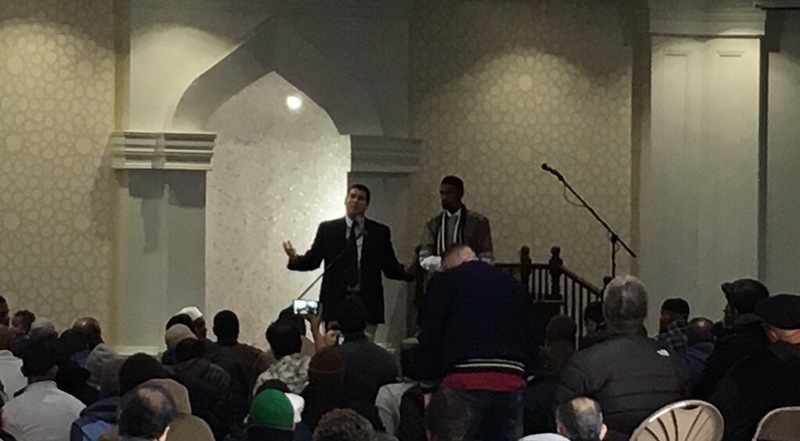 I was honored to offer words of Torah and teachings from the Jewish faith to those present at the masjid. Referencing Parashat Yitro, the Torah portion read the following day, I noted that Jethro brought Moses’ sons and wife to him, but Moses went out and greeted Jethro before he greeted his own immediate family. He bowed low and kissed him and invited him into his tent. He embraced his fellow cleric because he understood the importance of their relationship as two religious leaders, as two people of faith. We understand the importance of religious communities coming together. Because to embrace the other, and have the other as a friend, means we see the other in the same way that we see ourselves. And to know the other, is to truly know ourselves. How beautiful to learn from our brothers and sisters of other faiths, and grow in our own faiths as a result. Most importantly, we understand our responsibility to stand up for ourselves and stand up for others, made in God’s image. Doing so ensures that we continue to walk in God’s ways and honor God in the process. Attending a single service was only a small sign of solidarity. However, it also represented our deeper promise and commitment to stand with our neighbors and support them. As Jews, we know all too well what happens when others are silent in the face of bigotry and discrimination. We refuse to be silent and promise to stand united together. These are the words of a rabbi who spent the night in jail. These are not my words. These are the words of Rabbi Eugene Borowitz and 14 other rabbinic colleagues who on Thursday June 18, 1964, while praying in an integrated prayer group in downtown St. Augustine, Florida, were arrested. They came to Florida at the urging of Rev. Martin Luther King Jr., who spoke weeks earlier at the annual Central Conference of American Rabbis convention about the fierce urgency of now. I thought of this group and this story on Monday night as I spent the evening in a holding cell with 18 of my teachers and colleagues. We each took turns teaching words of Torah as inspiration and meditation, and singing words of our sacred liturgy, pleas that drifted towards the Heavens, turning NY’s 33rd precinct into a Makom Kodesh. I do not mean to compare or conflate the two. However, those words were an important reminder for me of the role of civil disobedience. It is those very words Rabbi Borowitz, and those very words of Torah that we taught each other that served as a spiritual catalyst for our participation in this act. We marched with hundred of rabbis towards Trump International Hotel, protesting what I believe to be the President’s anti-immigrant, anti-refugee, and anti-Muslim agenda. I did so – and continue to do so – as a Jew, a rabbi, and a human being. As a person of faith, any executive order that intentionally targets another faith, is deeply troubling, and a reminder of our obligation to stand up. We know all too well what happens when one faith doesn’t stand up for another. The Jewish people are also a people of refugees. For thousands of years we wandered. We were sojourners, either being evicted from or fleeing every home that we had known, fearing our own safety. That is especially true when we think of our ancestors who sought refuge, fleeing Nazi Germany. But additionally, we know that we are a community – and a country – of immigrants. My great grandparents immigrated to this country from the Ukraine. We each have our own family immigration stories. It wasn’t until the Jewish community settled in this country that we stopped having to seek refuge. Our Torah teaches us to welcome the stranger and reminds us that we too were once strangers. Our Torah also teaches us that we must not just come to understand the teachings of our faith; we must also act on them. And acts of civil disobedience are a common part of our history. I think of the midwives Shifra and Puah, who intentionally ignored the Pharaoh’s command to murder innocent children, and in the process, saved so many lives. I think of the Prophet Jeremiah, who put bands and bars on his arms and around his neck as a protest in the eyes of the King, a symbol of the impending defeat by Nebuchadnezzar. I think of Mordecai refusing to bow down to Haman. I think of Rabbi Shimon Bar Yochai, who risked his life to publicly criticize the Roman government, a government that prohibited the study of Torah. I think of Rabbi Abraham Joshua Heschel marching in Selma with Dr. King. I think of Rabbi Eugene Borowitz and his colleagues who wrote a letter from prison. And I think of so many in our community who march – and act – and serve as examples to me, reminders that we pray with our feet. So on Monday night, I marched with 250 of my rabbinic colleagues. And as we arrived at our destination, I sat in the middle of the street with 18 of my colleagues. We sat and we sang the words of Shirat Hayam, the Song of the Sea, words that we chant this Shabbat as part of Parashat Beshallah. These words that the Israelites sang upon crossing a split sea are words of courage, but also a promise of freedom — a freedom that I believe our faith obligates us to ensure for all. We sang Ozi v’Zimrat Yah, Vayehe Li Lishua. God is my strength and my song. And God will become my salvation. These words are not just a testament of faith. These words are a reminder for me of why I do what I do. I understand that as a rabbinic leader and public figure, every action has an impact – potentially positively or negatively – on others. I think deeply about the statements I make, the stances I take, and the forms of protest that I may participate in. I also consider those things that for many reasons I choose not to say or share. I know all may not always agree with what I say or do, but I hope that the decisions I make are respected because ultimately, everything I say, and everything I do, every statement I make, and every stance I take, is not rooted in politics, but rooted in Torah. They are rooted in the teachings of Pirkei Avot that remind us to especially speak up and act when others won’t. They are rooted in God serving as my strength and my song. They are rooted in my attempt to walk in God’s ways and fight for all made in God’s image. That is how I understood this act as well, an act of civil disobedience to remind all of our obligation to love the stranger. I understand that for some, this point could’ve been made — and has been made — without ending in arrest. The goal of civil disobedience is to raise the profile of an issue because of the importance of that issue. If such an act helped the world see and the government see that I, my 250 colleagues, and our faith, stand up for, protect, and welcome the stranger, the immigrant, and the refugee, then it served its purpose. 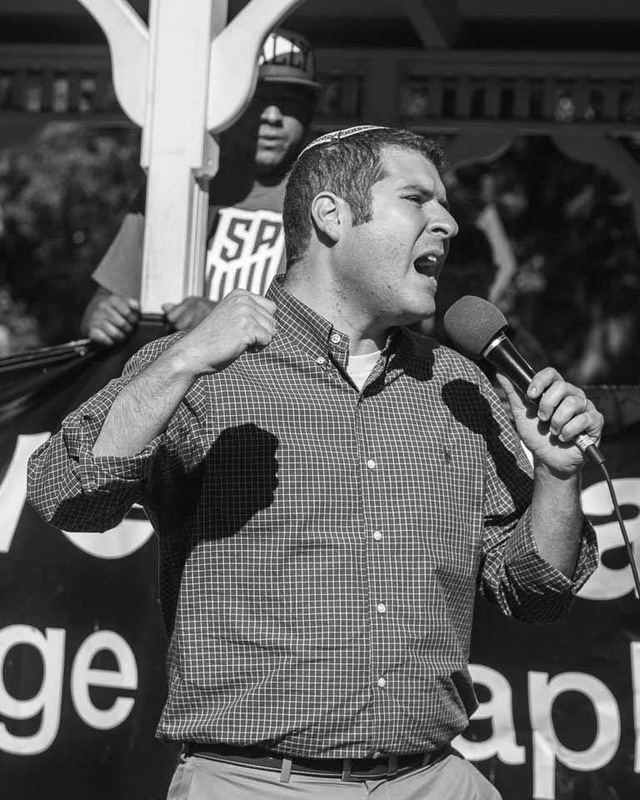 I also recognize the privilege I have as a white male, and as an upper-middle class rabbi. I understand that the NYPD may have treated a group of nineteen rabbis differently than they treated other peaceful protesters. I then have a responsibility to not only acknowledge that privilege, but also to use it: to speak for those who are fearfully silent because of their skin color, faith, country of origin, or uncertain immigration status. I spent the evening in jail for them. But I believe that I did so, standing on the shoulders of those who’ve come before me, guided by the values of our faith. I know that some may agree with my decision to act in such a way and some may disagree. I value the feelings and opinions of every member of our congregation and community. There is always a place in our community for every opinion and I hope that every member of our community will always feel comfortable sharing their feelings with me. Because ultimately, what makes a community a sacred community, a kehillah kedoshah, is our ability to share what we believe and feel with each other. I hope all will always feel comfortable talking to me, meeting with me, and sharing their opinions with me. We are a community that is committed to Torah. Everything I do as a rabbi and we do as a community is guided by our understanding of Torah. What makes our community so beautiful is our ability to discuss our own perspectives of Torah, even when we disagree. When Queen Esther was hesitant to speak up and stand up, she was reminded by Mordecai: “Do not think to yourself that in the king’s palace, you will escape any more than all the other Jews.” The Hebrew Bible urges us to speak up for others; doing so means that we are also speaking up for ourselves.